Napoli failed in their attempts to extract goalkeeper Gerónimo Rulli from Real Sociedad during the transfer window, with the Spanish side giving the Italians a taste of their own medicine by demanding a huge fee for the Argentine. Luckily for Maurizio Sarri’s side, Pepe Reina opted not to join Paris Saint-Germain after appearing poised to switch clubs, meaning Napoli now have another year to work on his replacement. And Rulli, who is forever associated with Manchester City, having been bought (without an announcement from the club), loaned to Real Sociedad (without an announcement from the club) and finally sold to Real Sociedad (without an announcement from the club). Despite his little-known stint as a Man City player, Rulli is still tied to the club by two clauses. The first is a 30% sell-on clause, entitling the Blues to a big chunk of his next transfer fee. The other, which City already tried to use but didn’t get the player’s nod, is a buy-back clause of around €15million. And according to Gazzetta dello Sport today, Napoli are expecting City to use that option next summer before it expires, after which they hope to do business at a ‘human price’ and sign the 25-year-old for less than the €40million release clause he currently has. The question is, will City agree to this? Pep Guardiola clearly wants two good goalkeepers at the club, as demonstrated when he tried to re-sign Rulli during the summer to challenge Ederson. With it being a World Cup year, Rulli didn’t want his chances of making the Argentina squad put at risk, so he rejected. 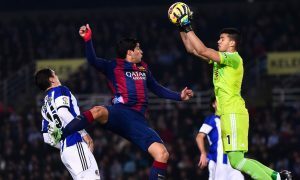 Next summer, the talented Real Sociedad goalkeeper may be more interested in a battle with Ederson at the Etihad – otherwise City could buy him back and sell for profit or cash in on the 30% they will receive of his next transfer fee. Lionel Messi delays contract signing, encouragement for Manchester City getting him free next year?